Technology has been a critical driver for innovation in the last 20+ years, enabling more efficient workflows, cost-savings, strategic business advantages, and driving massive shareholder value. But the adoption of technology in the procurement process has not driven the expected efficiencies it has in other areas. Enterprise procurement technology and corresponding procurement processes have become hopelessly complex due to the imbalance of control and speed. Consequently, procurement has become a large component of total revenues. In their recent white paper, Procurement Transformation – Driving Performance & Results Beyond the Limits of Leverage, Everest Group said that on average, for a typical billion dollar organization, procurement represents 30-50% of total expenses incurred. Multiple overlapping layers of approvals and complex workflows in the value stream have created a crisscross of work procedures. Communications problems, lack of transparency, and sub-optimal business processes have led to a misalignment of objectives, lack of innovation, and the creation of an onerous bureaucracy. So what’s the solution? How can enterprise procurement leaders achieve these efficiencies? The most successful strategies are always the simplest and most straightforward. One viable scenario is to embrace the “as-a-service” mindset and treat the procurement function as a platform that streamlines the process through a combination of cloud-based technologies, processes and services. Such an approach could help to solve the procurement process dilemma by diminishing complexities and adopting simple and consistent processes. 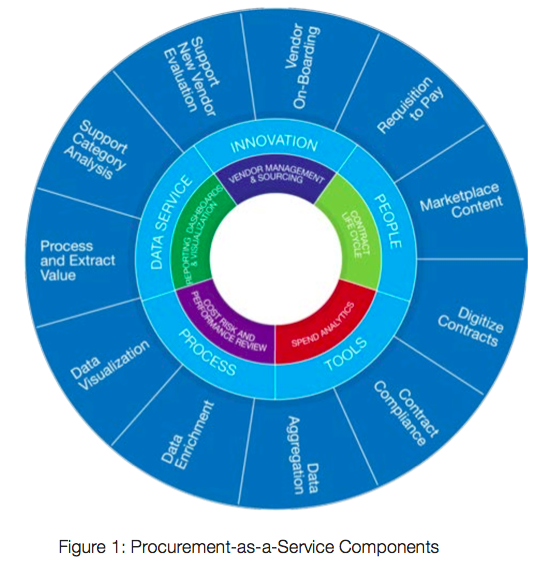 In Figure 1 we see a visual representation of the scope of a Procurement-as-a-Service platform. Procurement-as-a-Service begins with the understanding of your current supply base through Vendor Management. Managing vendor information and keeping it current leads to smart sourcing, helping you reduce buy-to-pay transaction errors and maintain parent-child vendor relationships. ￼￼￼￼￼￼￼￼￼￼￼￼￼￼￼￼￼￼￼￼￼￼￼￼Higher order spend analysis using a custom-built taxonomy helps segment suppliers into strategic, leveraged, critical and integrated vendors, allowing you to focus on the strategic and critical (single and sole sourced) suppliers to drive effective contracts. With an advanced Contract Lifecycle Management application, you can use digital forms for various types of contracts to create boilerplates, while also simplifying the negotiation process by allowing virtual redline versions during negotiations. Efficiency is gained by distributing responsibility at the clause level, so contracts can be reviewed by different functions. The use of electronic signatures and optimal workflows help make this a cost- effective solution, leading to easy process analysis and optimization. Spend Analytics is accomplished by gathering data from disparate systems, and after performing data quality checks, custom business rules are written to help you review slices of data to drive decision-making. It’s critical to understand spend categories, vendor segmentation, part analysis, pay term analysis, and to review spend under contract. Data science helps to manage contextual data to support decision-making, enabling quantum improvements in spend productivity. Using data science technologies you can perform a Cost, Risk and Performance Review on your spend. Vendor risks are classified by the nature of risks—single or sole vendors, vendors in volatile geopolitical areas, and vendors impacted by market factors (commodity, foreign exchange and regulatory conditions). Vendor performance is classified by analyzing on-time delivery, and performance against client needs and promises made. Mandating data selectively during purchase order creation and processing helps in garnishing data for decision-making. Finally, equip your staff with Reporting Dashboards and Visualization Tools to identify opportunities for further procurement innovation. Technology has been an efficiency enabler for corporations now for the last quarter of a century, helping companies make tremendous progress on the sales, marketing and marketing front. But till now the haphazard adoption of technology for the procurement process has only exacerbated a disjointed system fraught with inefficiencies. Procurement as a Service solves this problem by combining cloud-based technology with intelligently managed processes to manage vendors, enable e-sourcing, manage the contract lifecycle, analyze and report on spend, and review cost, risks and performance; a global procurement strategy. The combination of people, process and technology in a managed hosting environment is revolutionizing the procurement process, and is the next frontier in the business efficiency spectrum. For a more in-depth look at Global Procurement as a Service, download our new white paper: Why Global Procurement as a Service si the Next Frontier in Business Efficiency.